This newly updated science lab was left to the scrappers and criminals who have completely destroyed the school without any interference from the Detroit Public Schools. Scenes of devastation greet visitors to Crockett Technical High School in Detroit (taken September 2015). The destruction at Crockett would likely be the source of public outrage in other U.S. cities, but not Detroit. A year ago, in September 2015, I visited my birth city, Detroit. 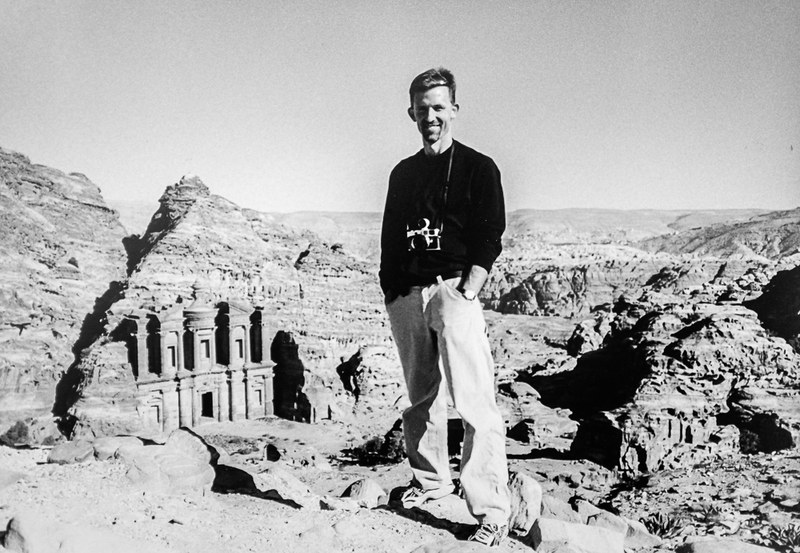 I saw things I could not imagine were possible in the supposedly most powerful country in the world. I toured the city and observed impoverished neighborhoods, shuttered factories, empty homes in every corner of the community, and the omnipresent ruins from arson that have made the Motor City the arson capital of the United States. Detroit had a surreal feel. I called it City of the Future and published several photo essays and a photo gallery on my web site. The most memorable and heart-wrenching place I visited was the now shuttered Crockett Technical High School, at the corner of St. Cyril and Georgia Street. 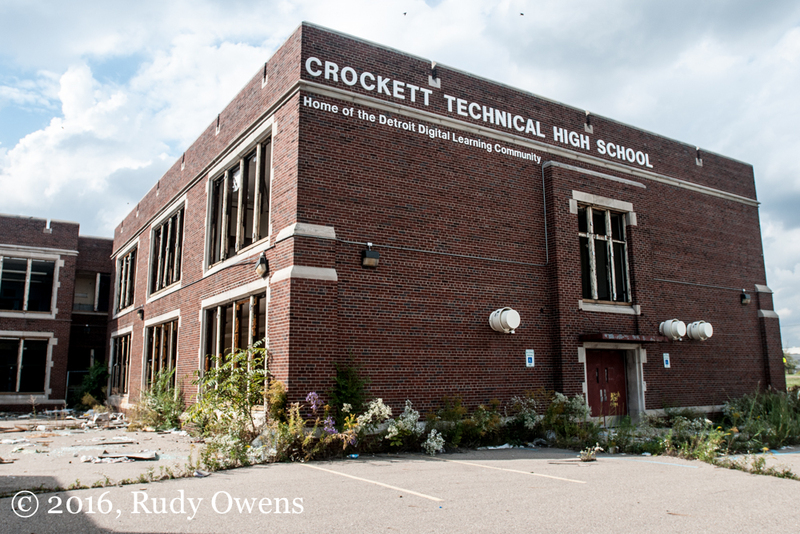 The trashed and gutted Crockett Technical High School was listed for sale in September 2015 by the Detroit Public Schools, which failed in every sense to protect the school from destruction by scrappers and vandals. In my last photo essay on this gutted and neglected facility of learning, I recounted that Detroit Public Schools (DPS) recently had implemented a painful round of massive school closures, carried out by DPS emergency manager Roy Roberts. In sum, 16 school buildings were closed permanently. In the previous decade, enrollment in the system had fallen 100,000 students, and by 2012-13, enrollment was about a third of what it was a decade earlier. What I learned during my visit to Crockett from two friendly neighbors who were across the street would have been intolerable in nearly any other major U.S. city. I wrote in my September 2015 photo essay, “They noted that the DPS police did nothing to stop the scrappers once the schools alarm system failed. First the scrappers busted the windows and ripped out the metal. Then they went to work on the interior. One of the men, who said he had lived on that corner much of his life, said he even tried to follow the criminal scrapper and his accomplice once. His calls went unanswered by the school district, he said, and the scrappers did their destruction mostly at night.” The tragedy was compounded, according to one of the neighbors, because the school had been recently fitted with high-speed internet connections to promote a science and technology curriculum. When I jumped into the old school, I saw newly built science labs completely trashed, eerily similar to how ISIS extremists would destroy monuments of culture and civilization in Iraq and Syria. But in Detroit’s case, the vandals were not crazed religious radicals, they were local residents, scavenging for scrap and destroying either for pleasure, anger, or both. Today, the DPS is rated the worst in the nation for test scores. In May 2016 The Atlantic reported, “… the country has probably never witnessed an education crisis quite like Detroit’s.” And, then to no one’s surprise and certainly not to anyone in Detroit, no one really gave a crap. What happens in Detroit no longer seems to matter, no matter how awful and absurd. After my trip to Detroit, I spent about four months trying to get respected Portland universities to host a lecture and photo show (click on the link to see how I presented the concept) on the decline of Detroit and how it looked in 2015. I was turned down by Portland State University, my alma mater Reed College, the University of Portland, and the Multnomah County Library. I made repeated requests to multiple faculty and these organizations. The topic may just be too depressing or impossible to comprehend. Even worse, the story about mostly black Detroit and its current woes, like the simple destruction of one fine public schools by the community itself, did not fit a narrative of race that is preferred many people at this time. A dominant narrative will always defeat an alternative story, particularly one that is rooted in ugly reality. I suspect this yawning disinterest was a combination of all of these factors. But let’s be honest. No one running for the nation’s highest office will ever see or want to see the real Detroit. Note, I published the same essay on my I Wonder and Wander policy blog on Sept. 30, 2016.